This book published by Cobb Landmarks and Historical Society, highlights fifty historic Marietta houses, showcasing a wonderful mix of historic architectural variety, from the Greek Revival, Gothic Revival, Italianate, and Queen Anne styles to the Colonial Revival and Craftsman styles of the 20th century. The interiors and exteriors are captured with 340 magnificent images including photographs by award-winning photographer Jim DiVitale, and historic images, many never before published. Readers will be captivated by stories of pioneer settlers like the Couper family of St. Simons, who were held captive by the Union Army during the occupation of Marietta in 1864 near the end of the Civil War, and the Glover family, who donated Marietta’s City Park. 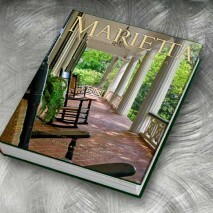 The stories are arranged chronologically and author Douglas Frey’s enthusiasm for his subject and his scholarship are evident on every page, and the result is not just a coffee table picture book but a true reference book, which truly captures the charm of Marietta by telling the history through its architecture. In addition to doing the design and layout of the book, STEEM took on the roles of project management, estimating/budgeting, photo editing, indexing, print coordination, marketing and promotion. 2,000 copies of the book were printed along with 175 special edition books which were bound in bonded leather and pre-sold. 1,000 of the regular-edition books were sold in the first seven months and the project has been a tremendous source of income for the Cobb Landmarks and Historical Society. This book won an American Design Award and a silver Ben Franklin Award from the Independent Book Publishers Association.